This domain is predominantly found in the protein 'Activator of Hsp90 ATPase', it adopts a secondary structure consisting of an N-terminal alpha-helix leading into a four-stranded meandering antiparallel beta-sheet, followed by a C-terminal alpha-helix. The two helices are packed together, with the beta-sheet curving around them. They bind to the molecular chaperone HSP82 and stimulate its ATPase activity (PUBMED:15039704). 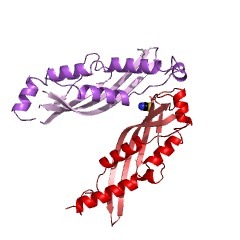 This domain is predominantly found N-terminal in the protein Activator of Hsp90 ATPase (Aha1). Aha1 adopts a secondary structure consisting of an N-terminal alpha-helix leading into a four-stranded meandering antiparallel beta-sheet, followed by a C-terminal alpha-helix. The two alpha helices are packed together, with the beta-sheet curving around them. The N-terminal domain of Aha1 interacts with Hsp90 and stimulates its ATPase activity [(PUBMED:15039704)]. There are 2381 Aha1_N domains in 2334 proteins in SMART's nrdb database. Taxonomic distribution of proteins containing Aha1_N domain. This tree includes only several representative species. The complete taxonomic breakdown of all proteins with Aha1_N domain is also avaliable. Click on the protein counts, or double click on taxonomic names to display all proteins containing Aha1_N domain in the selected taxonomic class. 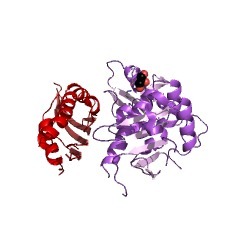 Structural basis for recruitment of the ATPase activator Aha1 to the Hsp90chaperone machinery. Hsp90 is a molecular chaperone essential for the activation and assemblyof many key eukaryotic signalling and regulatory proteins. Hsp90 isassisted and regulated by co-chaperones that participate in an orderedseries of dynamic multiprotein complexes, linked to Hsp90 conformationallycoupled ATPase cycle. The co-chaperones Aha1 and Hch1 bind to Hsp90 andstimulate its ATPase activity. Biochemical analysis shows that thisactivity is dependent on the N-terminal domain of Aha1, which interactswith the central segment of Hsp90. 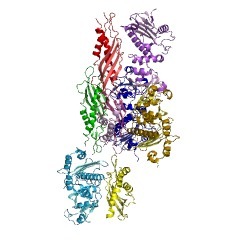 The structural basis for thisinteraction is revealed by the crystal structure of the N-terminal domain(1-153) of Aha1 (equivalent to the whole of Hch1) in complex with themiddle segment of Hsp90 (273-530). Structural analysis and mutagenesisshow that binding of N-Aha1 promotes a conformational switch in themiddle-segment catalytic loop (370-390) of Hsp90 that releases thecatalytic Arg 380 and enables its interaction with ATP in the N-terminalnucleotide-binding domain of the chaperone.